Beef stroganoff is a classic Russian entree that traditionally combines cuts of steak with a sour cream sauce and mushrooms. 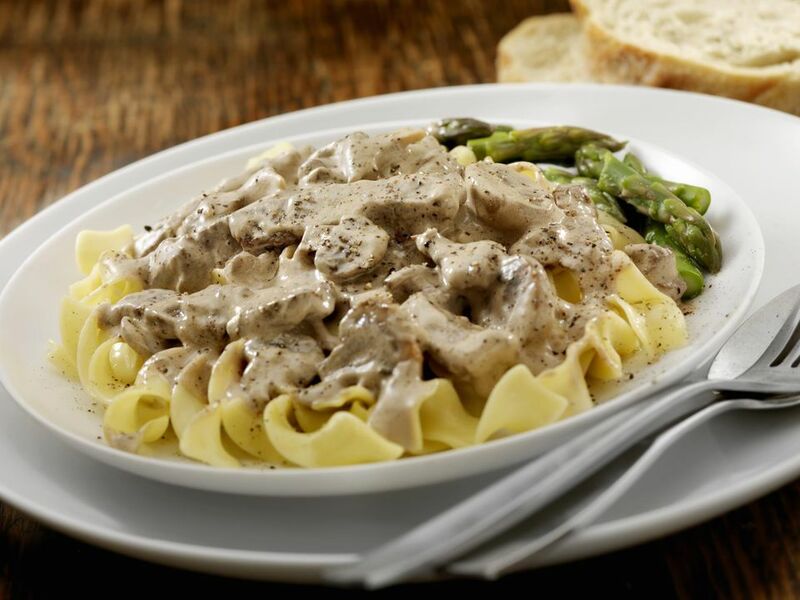 Today, beef stroganoff is usually served over rice or egg noodles, as it is in this dairy-free take on the traditional recipe. Use whatever cuts of steak you prefer. Rub the steaks with the pepper and salt. Heat one tablespoon olive oil in a heavy-bottomed skillet over medium-high heat and cook the steaks, flipping once, until cooked as desired, about 3-6 minutes. Remove the steaks from the skillet, add another tablespoon of olive oil and saute the mushrooms until browned. Remove from heat. Boil a pot of water, add the noodles and cook until just tender. Drain and set aside. Heat the remaining olive oil in a small saucepan over low heat and whisk in the flour, stirring constantly until combined. Add the beef broth, soy yogurt, soy ​milk, and Dijon mustard until well combined. Cook until slightly thickened and add salt and pepper to taste. To serve, portion the noodles on individual serving plates, tossing with oil and parsley. Place the steaks and mushrooms atop the noodles and pour the sauce over the dish. Buying small tenderloin steaks will save you time as they won't need to be cut. You can also buy two large steaks and divide them yourself. Cut against the grain of the meat to keep it juicy. Instead of using egg noodles, you can serve the stroganoff over rice, potatoes, or zucchini noodles. If sirloin steak is not an option, ground beef works just the same. If you're low on beef, bulk it up with veggies like sliced zucchini. Alternative dairy-free milk that you can use includes cashew cream, coconut milk, almond milk, or rice milk.